This afternoon in London, Arsenal put together the most fitting possible tribute to lame-duck manager Arsene Wenger by gagging up a result to Atlético Madrid in the Europa League semifinals in rather embarrassing fashion. Arsenal played almost all of the of the game up a man, thanks to some poor refereeing that saw Šime Vrsaljko pick up two yellow cards in the span of 10 minutes. Still, despite the lion’s share of the possession, Arsenal didn’t score until the 61st minute. 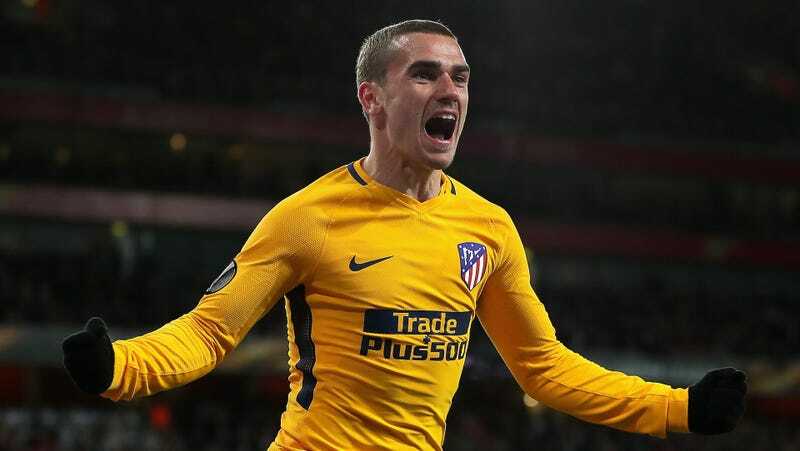 Just 20 minutes later, after two defensive subs from Atlético, Antoine Griezmann got loose on a long ball, punked Laurent Koscielny, got past David Ospina, then smacked it in past and through Shkodran Mustafi to seal a 1-1 draw. This is, obviously, very bad for Arsenal’s hopes of advancing to the Europa League final and getting to next season’s Champions League. The away goal means Atlético can advance with a 0-0 draw in the second leg, which shouldn’t be too difficult with their world-class defense. Arsenal created chance after chance, but they couldn’t finish or get past Jan Oblak, who was excellent. Congratulations, I guess, to Arsenal for shooting their dicks off in the silliest way possible.